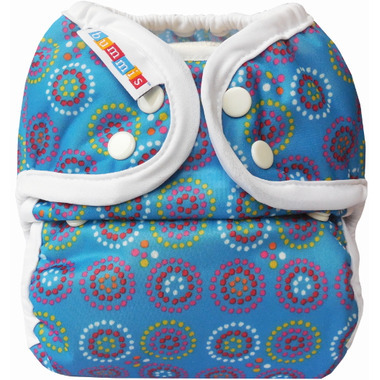 The Duo-Brite Wrap by Bummis is the perfect wrap - adjustable on two sides! Your baby will love being in this super soft all new diaper from Bummis. I find these covers wear a bit big. They also stain easily (the white lining part), which is disappointing. Overall it's a good diaper cover if you use flats. Keeps clothes dry. I bought 3 size 2 covers and I find them a lot smaller than other brands (ie. thirties) and the inserts do not absorb well. I have to pair them with bamboo boosters and they still leak. I used bamboo prefolds before and did not have any leaks but with these bummies, I do. It is sadly dissapointing.